Discussion in 'Small Form Factor Systems' started by Firewolfy, Nov 23, 2015. My big shuriken II just arrived over the weekend. I was thinking that all I had left to do was order the case, then I got the email notification for the start of the orders! Now all I have to do is wait by the mailbox. The Shuriken is pretty sweet, congrats! --And it fits with room to spare. Good deal Fire, I hope this batch goes smoother than the first one. Should go much smoother. A lot of the mfg and assembly was worked out with the last batch. Since it's going to be around 100 cases, it's not like I'm trying to build 500 or 1000 and stay on top of quality issues. I’ve been testing my Aorus gaming box GTX 1080 mini and was worried about it’s cooling capacity because it has been throttling most of the time that I have had it in my ncase m1, even when I took the side panel off. So I was worried that the card just doesn’t have a good enough cooler to keep itself from throttling. I decided to test it out in another case. With a LOT of work, I was able to shoehorn it in to my CustomMOD flex mini. I powered the system in the mini with an SFX power supply sitting outside the case because the flex ATX inside the case is only 220W. Both side panels and the top and front panels were removed to make it more open air bench feeling. Then I ran my usual loads that have been causing all the throttling when it was in the other case (playing WoW) for a few hours. I am very pleased with the results. Maximum temperature reached was 72 degrees—a full 10degrees cooler than the throttling temperature, and the gpu clock frequency was running at full boost the whole time. I am relieved that the throttling in the other case is not caused because the card’s cooler is insufficient. I’m going to try putting on the top/front and side panels and running this again to see if the temps climb very much. That is how all GPU fans should look! I'm trying to get a bit creative on the webpage. I think it looks better, but I need some feedback. Thx. I was thinking the same thing, then I found it on sale at microcenter for US$520 with a $50 rebate for a final price of US$470. I had to drive an hour and a half one way to get it, but I feel that the $230 discount was well worth It. Also, I have a nifty external GPU enclosure now. It should work for any graphics card that is short enough and uses the same 8-pin power. The results were disappointing. The ventilation of these side panels is clearly not enough because the temps climbed up to 82 degrees and the card started throttling again. Also, the close proximity of the side panel to the fan resulted in a dramatic increase in fan noise. As you can see this case does not have a very good ventilation pattern on the panels. IIRC, Firewolfy spent some time and consideration when coming up with the ventilation pattern for the MI-6, and so I think it will perform much better. My conclusion is that the Gigabyte GTX 1080 that comes from the Aorus gaming box has a good, quiet cooler, but it needs good ventilation to do its job. Do you know if the MI-6 will provide any additional clearance between the 1080 and the side panel over your current case? Also that is a really good deal on the Gaming Box, Newegg is charging $474 for the Gigabyte 1080 alone. I think it is a big improvement. The red vent pattern background looks good and makes it easier to see the pictures of the case. It was hard to see them before when it was all black on black. I would like to see pictures of the case that is the whole case, without the edges cropped off. I think it’s good for the panel to be close to the fan so that the fan will be able to pull air from the outside. I think the reason it overheats in my ncase is that the fan is too far from the vent holes in the bottom, so it just recirculates the hot air in the case. I don’t know if there will be a significant difference between my test case and the MI-6 in terms of the clearance between the fan and the side panel, but I think the key element is ventilation pattern. In my earlier post I said the fan noise was caused by the fan being close, but I should clarifythat. I think the noise was caused by the fan being close to the side panel with that specific ventilation pattern. I remember reading somewhere, an experiment somebody did regarding noise from different ventilation patterns. The results showed that the ventilation patterns did have a big effect on fan noise. Hope it works out in the MI-6. I just checked to see what you meant about cropping, lol. Almost every pic has some part missing. That is hilarious. Thx for the heads up. I don't want to digress from topic, but I wish someone would make that 4L back-to-back + FlexATX case other than CustomMod. No offense to CM, but their manufacturing is sub-par. Since the Hutzy XS was abandoned, we've only seen CM pick up that design. It seems like a pretty straightforward thing to do for ultra SFF, and you should be able to do it in 4L. Especially now that there are actual consumer FlexATX PSUs on the market, it would be a pretty mainstream build. If someone like CCD, NFC, or Dan were to implement that design, I think it would sell well. Where should the psu be mounted? The Flex-atx psu's are about 1.5 x 3.5 x 6", right? In a MI-6 style case, you only save 1" on overall height. I ended up running my test system again with the side panel on, but the top/front panels removed and almost all the throttling ended. The concept in my test system (and the hutzy design) is that the gpu fan and cpu fan bring in fresh air and that positive pressure would force all the hot air out, but in my tests, it doesn’t quite work. A lot of recirculating of hot air happens. I think that design needs some fans, or more ventilation holes to let the hot air out. Are you using a bottom intake fan? You are right, I forgot he had a CustomMod. The bottom fan in the MI-6 seems to really help with pushing the hot air out the top, I am waiting for Firewolfy to release the loft so I can add 2x92mm fans at the top for exhaust. With the size / spacing of the venting / perforations on the loft, a single 120mm fan (Noctua NF-A12x25 PWM 'Sterrox') might be best...? Not even the C7, just the L9i. Again, the idea is smallest possible case that still supports a full-profile dual-slot graphics card. That's how you get to 4L. You could make an even smaller externally powered version with only 24-pin DC-DC and M.2 support, should come it at ~3.3L. You're pushing MicroSTX volume there, but with everything being fully desktop. Would love to see someone make these other than CM as powerful off-the-shelf almost NUC-class gaming machines. Would be cheaper and more powerful than any Mini PC, and smaller than most of them. A truly portable fully custom PC. I call on the community to do this. Again, sorry for digressing. I do love the MI-6, it does have a unique place currently as the only 7L-class case that trades off GPU length for CPU cooling. But the person who posted the FlexATX case got me thinking about 3-4L concepts again. Boil is right, I am using a custom mod case for my testing which has no fans at all. The lack of fans really is a much bigger drawback than I anticipated. I was sure that the GPU fan and CPU cooler fan would be able to pull in fresh air from the outside creating positive pressure to keep forcing the hot air out, but I was wrong. The GPU ends up recirculating hot air instead of pulling in the fresh air. 2. because of all the problems cooling the CPU with short coolers that I have seen people reporting in other threads like the sentry and Dan A4. After the tests that I have run since I got my GTX 1080, I realized that I f you move to higher power components, cases such as the Hutzy or custom mod will even run into overheating issues with the GPU because the ventilation isn’t enough. The custom mod case I have works just fine for the (not overclocked) GTX 1050 / core i5 HTPC that I normally have in it, but it’s just not quite enough for what I want in my main system. I agree that the GTX 1080 from the Aorus gaming box might be the highest performing graphics card for the MI-6 because of the 130mm fan, but after testing the card out in a somewhat similar case, I think the lack of a shroud on this GPU makes it a bit of a double edged sword. 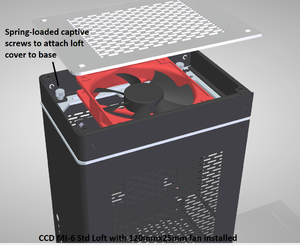 You get a more quiet fan, but without the shroud, the fan is more likely to recirculate hot air inside the case. The case’s side panel does not act effectively as a shroud by itself, but I think if you make a duct extending from the side panel surrounding the fan, then the recirculation problem might go away. This is the next idea I plan on testing. For the MI-6 Second Edition production batch, we haven't reached the 100 case minimum order quantity yet, so the ordering is going to remain open. It had been targeted to be done by Sept 4. Good news is that the prep work is pretty much done with the suppliers, so things can get rolling as soon as I can pull the trigger. EnzoFX and rfarmer like this. Firewolfy I know you are still trying to get orders for the 2nd edition and probably haven't done too much regarding the lofts... But I was just wondering if you have a ballpark on the price for the two lofts yet? I'm interested in getting the taller loft for my 1st gen MI-6. Thanks! Still working to get it to $50. But it depends on volume of course. I had 1 case reserved from the first batch, in case of any customer problems. Now that we are ready to go to batch 2, I went ahead and sent the case out to a reviewer for PerformancePSU. So should get some more publicity. Frazhna and rfarmer like this. I hope PerformancePSU does a good job. I keep thinking about the tech everything video and it has always bothered me that he said the ventilation wasn’t good enough even though he set up the CPU cooler as exhaust. And it was a oc’ed 8700k. Sure we gotta aim high but how many of us are actually doing this? I am, but you need to delid and his wasn't. I have to say... I'm a little disappointed with the new lid attachment for the lofts. I like having the lid attached with screws on my MI-6 because the lid doesn't pop off when I'm transporting it like it did with my NCASE M1. If your lid popped off, did you not have the M1 in a bag/the box it came with? I still have the one mine came with, v1. Actually my M1 has a tiny screw for the top panel, I believe this was removed with later revisions. I travel with the NCASE M1 in a large backpack to carry on a plane. I may get the custom Wallye Tactik Duffle if it ever becomes available again on the SFF Lab website. The screw in the top plate was removed in Rev. 2 of the case--I have a Rev. 4. I'm sorry to hear that a friction-fit top plate would be a problem for you. Just to clarify, the friction fit is only when attaching a top plate onto the loft. The standard case still has the top plate attached with screws. I'll do some brainstorming to see if I can make the design so it can convert between friction fit and screw attachment. I posted on the CCD webpage, and SFF, and I could use your help on the Loft design if you have a minute. Need to decide on how to attach the top plate to the Lofts: 4 screws or the 4 friction fit clips? I made a straw poll HERE, and/or you can comment here. Thanks! Oh, and Loft info is HERE. The CPU cooler envelope is 68mm for the MI-6, but a cooler height of 65mm is recommended. The Raijintek Pallas is 68mm tall with a top-mounted 140mm fan and seems to perform only slightly worse than the Noctua NH-L12 with both fans and a little better than the NH-L12 with only the bottom 92mm fan. Has anyone tried one of these in the MI-6? I know that it will make more noise to have the fan so close to the case cover, but the 140mm fan (1400 RPM max) should help with the noise, right?